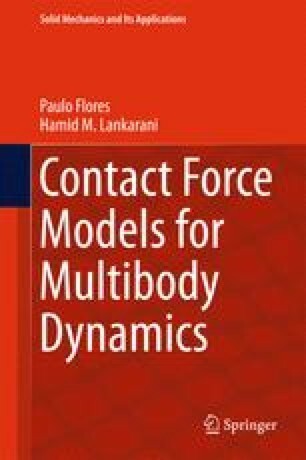 In this chapter, some of most relevant dissipative contact force models utilized in multibody dynamics are presented. In particular, attention is given to the constitutive laws proposed by Kelvin and Voigt, Hunt and Crossley, Lankarani and Nikravesh, and Flores et al. Additionally, other nonlinear contact force models are briefly presented. The contact force models are mostly developed based on the Hertzian theory, augmented with terms to accommodate the energy dissipation associated with the contact-impact process. The main differences and similarities among these continuous contact force models are discussed by utilizing an application example based on the externally collision between two spherical solids, and a comparative study of the various contact force models is presented. The variables utilized in the study are the contact force and the penetration between the contacting bodies.